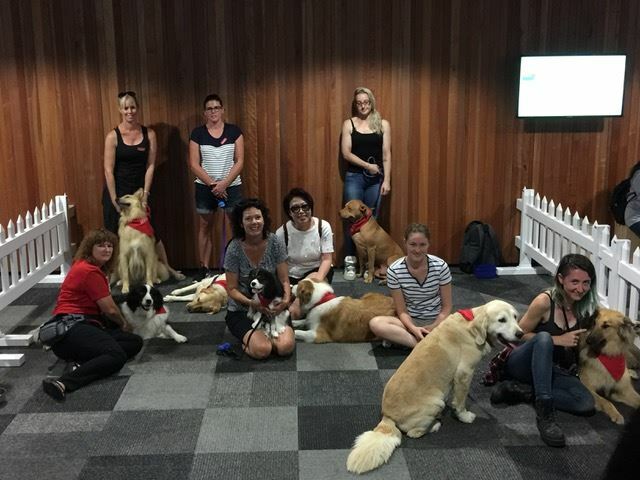 It has become very popular for some large organizations such as Universities, Corporates or Event Organizers to request several Canine Friends Pet Therapy volunteers with their dogs to visit their premises as a group. These are often in response to particular events like Mental Health week, pending university exams, new student orientation week, Pet Expo days and Special Children’s Christmas Parties. The Pet Therapy dog teams have to be comfortable in this environment as they will often be crowded by many people wanting to pat, take lots of selfie photos with people they have never met and also cope with other fellow Canine Friends dogs (but must not want to engage with other dogs in play). Not every Pet Therapy dog makes a good Group Visiting Dog and it is important for the owner to realize this. These events can only happen if at least 4-6 weeks notice is given to the Event Organiser. Also, the requesting organisation should have parking available for the Canine Friends volunteers and a large space that enables people to pet a dog comfortably. We do not ask for any fees for providing group visits but are very appreciative of any donations offered to recognise the time and commitment of our pet therapy teams.